The Sew Mama Sew Giveaway Day (for a week) is over. 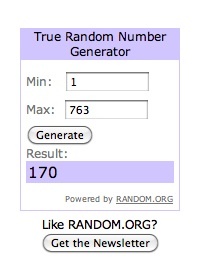 Thank you for the opportunity to participate in such a huge giveaway event! 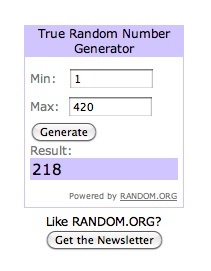 Of the 420 entries for the 241 Tote (made with Anna Graham's lovely pattern), Debra has won! For those of you who did not win, I recommend this pattern. It is easy to follow, and the tote is a fairly quick project. And of the 763 entries for the Echo fat quarter bundle, by Lotta Jansdotter, (read about her here at Windham Fabrics) Rachael has won! I also am a winner, because I now have a great number of book and movie recommendations for relaxing by the fire over the holidays and baking ideas for this weekend and next week in preparation for the holidays. I have tried to respond to each comment, but there were so many that I was not able to get to all of you. Thank you to everyone for taking the time to share their ideas and recommendations with me as you visited all the giveaways. And welcome to all the new followers - although following my blog did not give people an extra entry in the contests, I am happy to see that some of my visitors thought they should follow along for the future. Now that all that excitement is over, I hope to get back to sewing and baking this weekend. Oh, and time to get some shopping done too. Enjoy the weekend! yay! congrats to your winners leanne! i have my winner but cant figure out how to make my random number thumbnail to paste into my post... how did you do it? Congratulations to the winners, Leanne. They were fabulous giveaways and you deserve every follower! Well done to the winners. I have a 241 tote and love it, I make people laugh when I say it makes me feel young as I sling it over my shoulder!! Congratulations to Debra and Rachael! Congrats to the winners, and enjoy your new reading/viewing material while munching down on your baking! congrats to the winners! this was a great giveaway!